Celery is nowadays one of the quintessential "diet foods," but this vegetable hides plenty of medicinal uses. Celery, a vegetable originally from saline coastal regions in both Europe and Asia, is one of the most popular cooking vegetables, and has been used by the culinary world for centuries. Today, is it frequently found in household kitchens, where it is valued for its distinct crunch. However, there is not as much awareness of its immense nutritional and medicinal value. Learn more about celery, from its history and medicinal value to its plant characteristics and growing options. Relieving water retention. Celery works as a diuretic, helping to flush excess fluid from the body. Reducing inflammation. The anti-inflammatory properties of celery bring relief to joint and muscle pain. Alleviating menstrual cramps. The high antioxidant content in celery helps reduce pelvic pain before and during menstruation. Promoting digestion. A large concentration of insoluble fiber improves digestion and promotes healthy bowel movements. The main reason for celery's varied medicinal properties is its high nutritional value. Celery contains large amounts of antioxidants and flavonoids, mainly apiin. 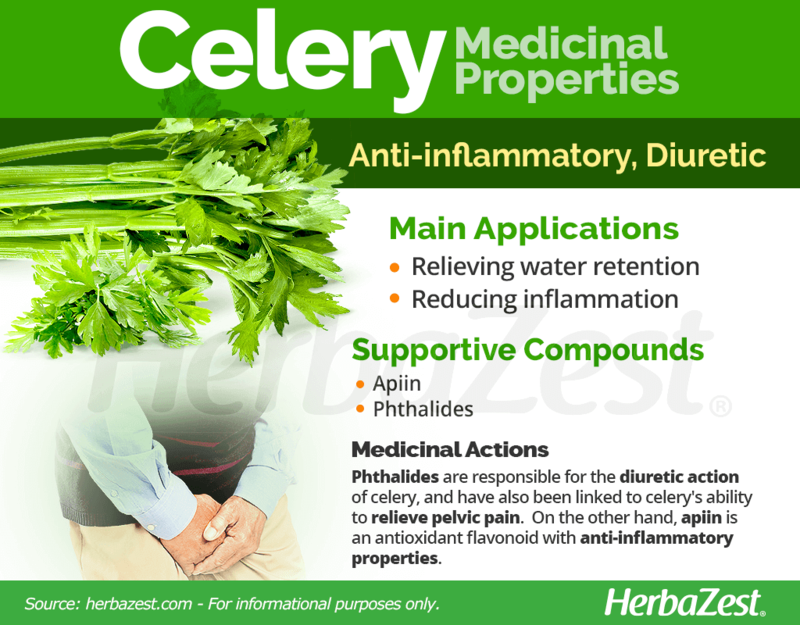 The most described and studied medicinal use of celery is as a diuretic thanks to the action of phthalides present in its stalks, which have also been linked to celery's ability to relieve pelvic pain. Thanks to its antioxidant content celery acts as an anti-inflammatory agent. Its high insoluble fiber content provides celery with the ability to regulate digestive function and speed up intestinal motility. Other herbs with anti-inflammatory and diuretic properties are asparagus and maize, while pineapple and rhubarb are examples of digestive herbs for constipation relief. Celery is safe for most people when consumed orally. However, it may cause allergic reactions and minor skin irritation for those with sensitivities. Individuals who have bleeding disorders or low blood pressure should limit their consumption of celery, since it can interact with certain medications. For this reason, eating celery before surgery is not recommended. Individuals who suffer from kidney problems should not eat celery, since it can cause inflammation. While it is typically safe for women who are pregnant or breastfeeding to eat celery, they should limit their consumption, since excessive amounts can contract the uterus and potentially cause miscarriages. Celery is not only high in water content and dietary fiber, both of which contribute to a prolonged feeling of fullness and satiety, but it is also a good source of vitamin K (phylloquinone), which promotes coagulation and healthy bones. Additionally, celery leaves and stalks provide adequate amounts of vitamin B9 (folate), vitamin B5 (pantothenic acid), and potassium, along with small amounts of other B-complex vitamins, mainly B2 (riboflavin) and B6 (pyridoxine). 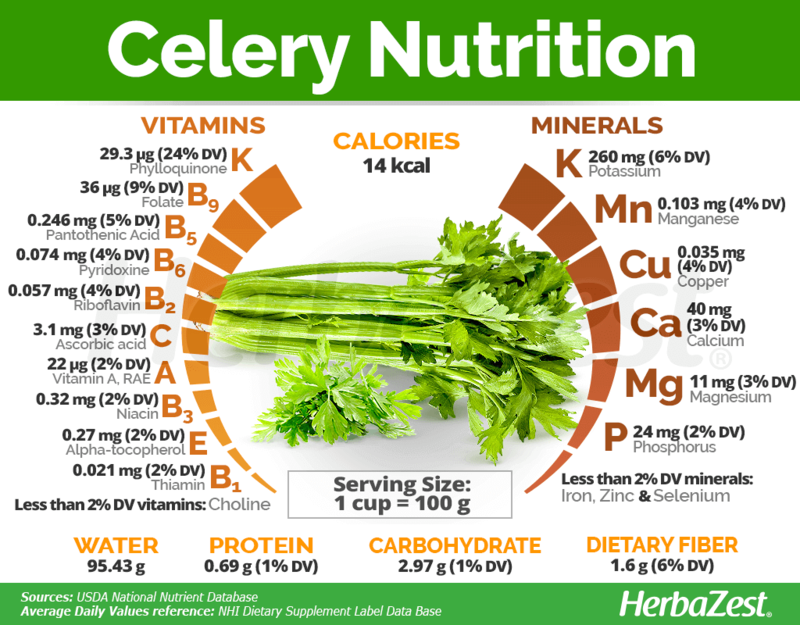 100 grams of celery stalks provide 14 calories and 6% of the daily value for dietary fiber. Commonly consumed in its raw state, celery has numerous medicinal benefits in both its food and medicinal states. Learn the different ways each medicinal remedy can be beneficial. Raw. One of the most popular methods of consumption, raw celery stalks work as a diuretic, promoting urination and eliminating water retention. Cooked. When cooked, celery retains many of its health benefits that have made it so well-regarded. In this form, celery can relieve joint pain due to its anti-inflammatory properties. Dried seeds. 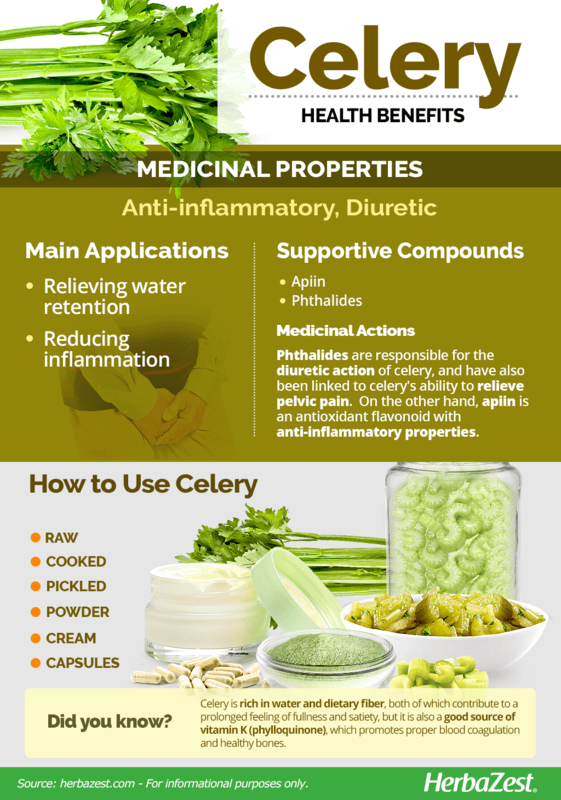 In one of its most ancient medicinal forms, celery seeds have numerous properties that make it beneficial. One of its main benefits is as a diuretic, which helps stimulate urination and relieve water retention in the body. Infusion. When brewed into a hot tea, a celery infusion can relieve muscle cramps by lowering the inflammation of the pelvic muscles. Liquid extract. When made into a liquid extract, celery has numerous medicinal properties, including promoting digestion, due to its high insoluble fiber content. Capsules. In its most potent medicinal form, celery capsules have numerous health benefits. Because of its anti-inflammatory properties, celery capsules can relieve muscle and joint pain in the body. Raw celery is very easy to purchase in most grocery stores or local markets around the world. The most common presentation of raw celery is the whole, unwashed stem with the leaves on top. Celery seeds for gardening can be found in plant nurseries, and dried seeds for preparing home remedies are widely available through online retailers. 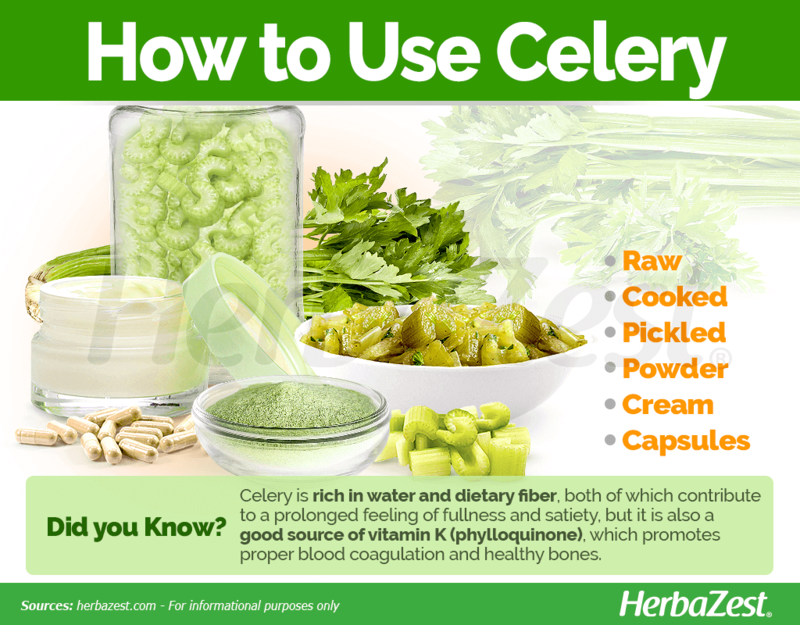 Celery supplements, made from the seeds of the plant, can be found in specialized health stores and online retailers. Each brand of celery supplement may come with different concentrations. They are overwhelmingly more common in capsule and tablet form, though liquid extracts are also available. Celery should be planted in rich, moist soils. In fact, before planting, working organic fertilizer or compost into the soil is recommended. Mulch and water directly after planting. Celery can tolerate saline soils, and it is often planted in deep trenches after reaching between 6 - 8 inches (15 - 20 cm) high. Celery is a heavy feeder. It also requires lots of water. Make sure to provide plenty of water during the entire growing season, especially during hot, dry weather. If celery does not get enough water, the stalks will be dry, and small. Add plenty of compost and mulch around the plants to retain moisture. It is also important to fertilize regularly to help the soil retain moisture and nutrients. Once it is transported to the field, celery should be planted in rows leaving eight inches (20 cm) between each plant and two to three feet (60 - 90 cm) between each row. Harvesting should be done by cutting the plant just below the soil line. The darker the stalks become, the more nutrients they will contain. Texture changes with color, dark green stalks will be tougher. Celery is a marshland variety of Apiaceae plant that has been cultivated for culinary and medicinal purposes for centuries. Depending on its cultivar and possibly its location, celery is used for its stalks, leaves, or hypocotyl, as well as celery seeds and extracts. Celery leaves are pinnate to bipinnate with rhombic leaflets that are 1 - 2.5 inches (3-6 cm) long and .5 - 2 inches (2--4 cm) wide. The flowers that bloom are creamy-white and are produced in dense compound umbels. Celery, scientifically known as Apium graveolens, is a member of the Apiaceae family, which contains mostly aromatic plants, including 3,700 species spread over 434 genera. The Apiaceae family is commonly known as the carrot or parsley family, and it contains many other economically-important herbs, such as coriander, dill, and angelica, as well as carrots and parsley. Since the days that celery first began being cultivated, four different varieties have been identified. These are leaf celery (var. secalinum), which produces a thin stalk and aromatic leaves; celeriac celery (var. rapaceum), which is identifiable by its large root; stalk celery (var. dulce); and plain celery (var. graveolens), which touts long, crunchy stems. Celery was first domesticated by humans as far back as 1300 BCE, when it was grown as a food crop in Asia. It is believed that celery was used as a food commodity during the lifetime of Egyptian pharaoh Tutankhamen, who died in 1323 BCE, as celery leaves were found in his tomb, and celery dating back to the 7th century BCE was recovered in the Heraion of Samos. Homer mentions celery growing wild in the city of Troy, and it is depicted surrounding the cave of Calypso. Celery finally found its way into European cooking in the 1600s. Celery is an economically important vegetable. It is available commercially as seeds, seed oil, whole vegetables, and oleoresin. India is the biggest exporter of celery, exporting over 5,000 metric tons (5,510 short tons) a year. The price of Indian celery, which accounts for half of the world's market, has remained stable. Yearly consumption of celery in the U.S. is seven pounds (3 kg) per capita. California and Florida account for 90% of the U.S. production of celery. Celery had numerous uses in ancient Rome and Greece. 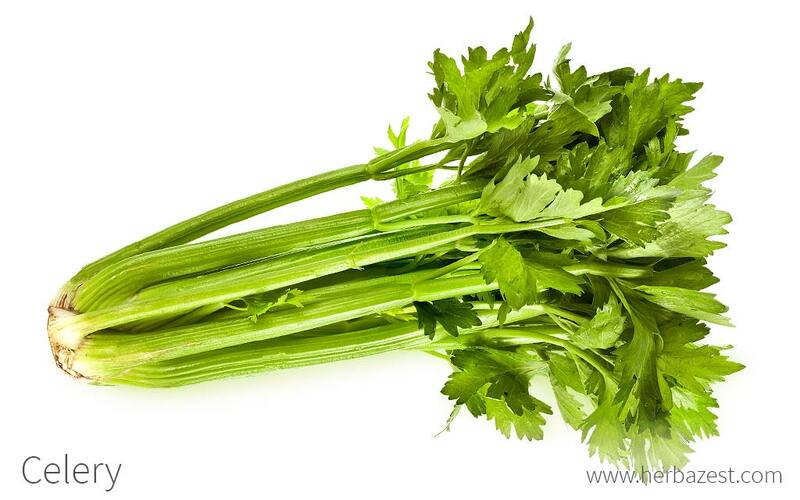 In ancient Rome, celery was considered an aphrodisiac, attracting women to men. In ancient Greece, it was used as a bouquet of flowers to reward the winners of the ancient Olympic games. Germplasm Resources Information, Taxon: Apium graveolens L.